The EMS High Precision, DLC tweezers feature tips covered in a pure diamond film grown directly on the exposed metallic substrate via an innovative plasma-assisted deposition technique. It is not an adhesive-bonded diamond powder. The coating is comprised of carbon clusters which develop a crystalline structure and properties similar to a natural diamond. This procedure leaves the coating hydrogen free. 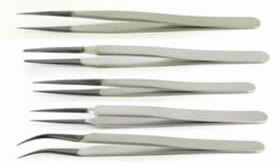 These tweezers perform well in demanding enviroments and working with hard samples or biological materials. Ideal for use in clean rooms. Tips stand up to repeated use. 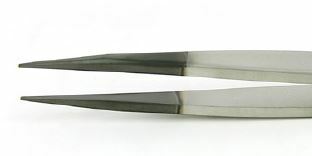 The body of the tweezer is non-magnetic, low carbon stainless steel. Anti-Acid/Anti-Mag SS - tips: straight, sharp, fine, superior finish. OAL: 120mm, 4¾", Flat, sharp fine tips. Anti-Acid/Anti-Mag SS - tips: flat, round, curved, superior finish. OAL: 120mm, 4¾", Curved. Anti-Acid/Anti-Mag SS - tips: straight, extra fine, superior finish. OAL: 110mm, 4¼", Extra fine tips. Anti-Acid/Anti-Mag SS - tips: straight, extra fine, very sharp, superior finish. OAL: 140mm, 5 1/2", Extra fine tip. Anti-Acid/Anti-Mag SS - tips: straight, extra fine, very sharp, superior finish. OAL: 150mm, 6", Extra fine tip.